I’ve been reading a lot of consciousness bending related books lately. It’s a topic that I adore—seeing how malleable the fabric of reality is and seeing how far I might be able to bend my abilities (and improve my life) based on mind-tricks, magic, and believing that I can. I’m open to exploring, experimenting, and noting what is miraculous and what is cool and going on from there. I mean, I really don’t have anything better to do with my spare time, right? As long as I’m not hurting or manipulating anyone—perhaps changing what happens for and around the people in my life, in relation to my life—always for the best, or that’s my intention, anyway. I’ve been quite successful in the past with manifesting this and that, including a pure-bred beagle puppy (who taught me to watch out what I wished for), 12 hundred bucks, and some other more personal signs from the Universe. Over the Christmas holiday, I was reading Breaking The Habit Of Being Yourself, written by Joe Dispenza and I was also listening to his audiobook, Becoming Supernatural, in tandem with reading the book. Basically, his books teach about shifting your reality and connecting yourself to Source energy in order to create miracles in your life by connecting with the subconscious and harnessing the power of intention, possibility, and now. It’s all good stuff. 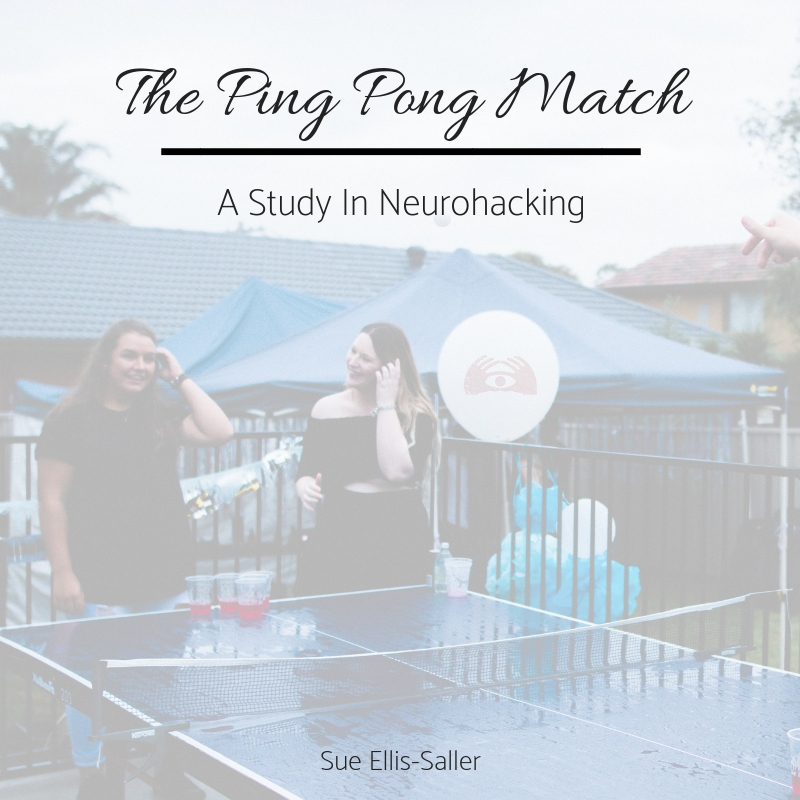 I had the perfect opportunity to test out some of the theories that I was learning because my in-laws bought a ping pong table and playing ping pong was a central part of what we were focused on during our Christmas holiday. If we weren’t eating, talking, or chilling during the week of Christmas, we were playing ping pong or watching a match. I’ve never played ping pong in my life that I can remember; I am a total novice. Recently, I started taking tennis lessons, but tennis is a different sport and, while ping pong and tennis are similar, they just aren’t the same. As I said, I was a noob. My hubby, my father-in-law, and my brother-in-law had practiced during our summer vacation because the hotels we stayed in had ping pong tables. I hiked and snorkeled. While their games were fiercely competitive and laced with male energy, mine was more exploring, experimenting, and just trying to do my best. So coming into these games with various family members, I was looking like a baby—just having fun and returning what balls I could. My volleys weren’t long for sure. For me, it was more about having a good time with my family while we celebrated Christmas together. My skills were temporary and completely mentally driven, though. My thinking brain convinced my body that it could play a mean game of ping pong, and so it did. Just like in the books I was reading, just like in others I’ve read before, I played out my game with my hubby in my head. I imagined I knew what I was doing. I let my understanding of hitting the ball soft or hard and holding the paddle at different angles to hit the ball in different directions on the table tell my body what to do. I ended up running my husband ragged on his side of the table while I handled the balls he hit to me more easily than I expected. He beat me, but not by much. Our games were exciting! It was fun for me to put what I was learning into practice—maybe more fun than seeing my husband work for his wins! So, why the increased ability to play ping pong, or the spike in my skill level? As I said, it was my thinking mind or intentions believing that I could and intellectualizing the game, then trusting my body to be able to do what my mind envisioned. Maybe I should have gone as far as imagining that I won, but I was happy with doing as well as I did. In Joe Dispenza’s book, he looks at the study that measured muscle strength increases in people who only imagine doing exercises, or comparisons in improvement and muscle function after a person merely practices a piano exercise in his or her mind. It’s scientifically sound research with a control group, a group that practices the exercises in real life, and then the experimental group. It shows circa 10-15% improvement in those who only think about flexing muscles. The piano playing group also has a high percentage of practice related muscle and skill changes—I forget the actual percentage. Ultimately, it made me even more aware of the fact that I could use my mind to surprisingly improve my life (skills, comprehension, ability to do things I normally couldn’t do). I’ll keep experimenting with neurohacking life and pushing the proverbial envelope further and further to see what I am capable of doing.